I have seen the creations of Wearing Memories before and I am always greatly impressed, but I have to say the way it was showcased during Fashions Finest Off Schedule show for London Fashion Week was brilliant; complete perfection. Here you have a nice crisp runway, and all of a sudden these mysterious silhouettes move down the runway, like poised burglars wearing black Morphsuits and amazing pieces from Wearing Memories. This was brilliantly executed because when you have these stunning models walking down the runway wearing a great dress as well as pieces of jewellery, it can sometimes be hard to focus on the jewellery alone. Having the the models in Morphsuits was such a great idea! The pieces are in the shapes of rings, bracelets, necklaces and my favourite, the Back Bone piece. It links 14 Wearing Memories lockets together following the line of your spine, perfect for a backless dress. So what is Wearing Memories about you wonder? Well, I will tell you because it’s quite a brilliant idea actually. I love Champagne and sometimes, when I enjoy a really good one, I keep the champagne cap to remember which one it was. Don’t you? See where I’m going with this. 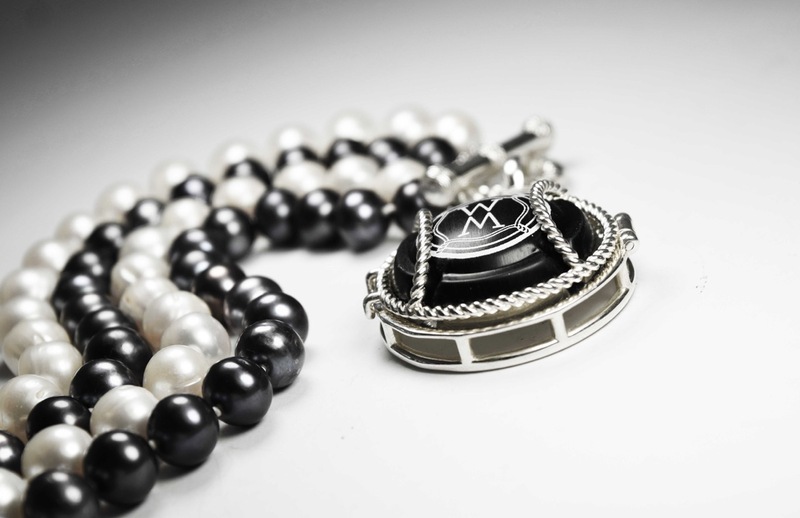 Wearing Memories are stunning luxurious creations that holds a champagne cap as the centrepiece, if you will, the memorable cap is then surrounded by different elements such as pearls, crystals, silver and gold. These creations are designed by Kiron Barui (such an amazing woman), who used to collect the caps from bottles of champagne, write the date and the company on the revese side to remember the moment. The jewellery is produced in Australia, but is well known and coveted around the world, and to bring that Australian touch to it they are presented in a kangaroo skin pouch. A nice feature is that all pieces are interchangeable so if you have a favourite champagne cap you’d like to wear as a ring rather than the initial bracelet then just swap and you have a new look. During this amazing show at Fashions Finest, she revealed her new collections, the “Element Collection” and the “ Choker Collection”. The Element Collection has lava and silver and features the gorgeous “ Back Bone” piece. One favourite piece amongst the fashionistas is the Rosary worn by Garek, a New York based singer-songwriter who was part of the finale where he got down on one knee and received a custom made Wearing Memories crown. It was all very intense but so very amazing. I will admit I was completely mesmerized. So if you want something different, something eye-catching or maybe something that will hold a memory of a good evening with that special someone, sharing an amazing bottle of champagne, then Wearing Memories is definitely something for you.